Yesterday DEEP JEWELS held a press conference to announce that 21 year old Nakana Kawamura of the idol group Masked Women will make her MMA debut on the Dec. 3 show at Shinjuku FACE. They announced her opponent today. Of course an idol who can fight is a big dream of DEEP JEWELS matchmaker Shigeru Saeki. In the past, attempts to turn idols into fighters has backfired on Saeki. The most recent example of this was the DATE girls who now wrestle for Ice Ribbon. Nakana announced this while on stage at the Tokyo Masked Women Cafe. Fans in attendance didn't know what to think. It seems that Saeki is trying to sell Nakana as a serious fighter. He asked her fans to support her fighting as it's very dangerous. 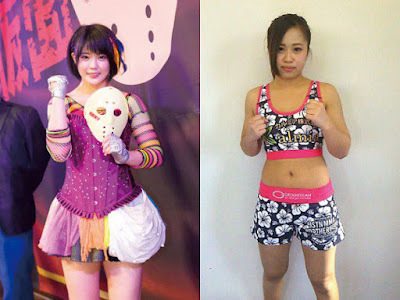 Nakana has been training at Reversal Gym Shinjuku trained by former DEEP fighter Takeshi Yamazaki. She's been training since May and Yamazaki contacted Saeki a couple of weeks ago to set this up. Saeki watched her train and now she's fighting. Today they announced that her opponent will be 19 year old REICA also making her MMA debut. She trains at Ishitsuna Gym. She has been training boxing for four years. This fight will be at Atomweight. But I'm not sure if the match is pro or amateur. They haven't announced the rules yet but I think it will be an amateur match because Saeki wants Nakana to wear headgear as protection. Obviously Saeki is crossing his fingers because Nakana can be a major draw if she is any good as a fighter.